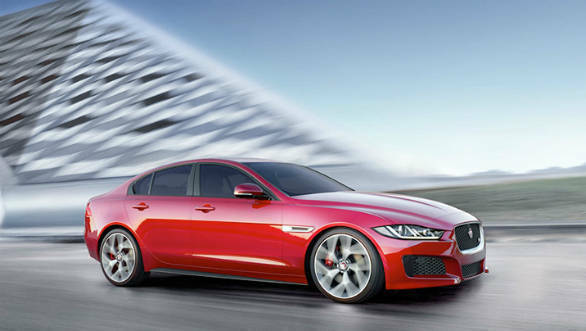 Jaguar Land Rover India has updated the XE and XF sedans with a new 2.0 litre petrol engine. This engine comes from their Ingenium line-up of lightweight, aluminium construction powertrains and is available in two states of tune - 200PS and 250PS. The Jaguar XE with this powertrain is priced at Rs. 35.99 lakh while that of the Jaguar XF is Rs. 49.80 lakh. The 200PS version is being offered on the XE Pure and Prestige as well as the XF Prestige trim levels, while the 250PS option is offered on the XE Portfolio and XF Portfolio trims. These engines are mated to the 8-speed ZF-sourced torque converter automatic gearbox. These Ingenium engines employ a low friction aluminium-intensive design to increase thermal efficiency and reduce weight which in turn improves fuel economy. The twin scroll turbo in these engines should reduce the turbo lag and improve power output. Jaguar claims that these Ingenium engines will deliver improved efficiency, lower running costs and enhanced performance. The Jaguar XE competes with the likes of the Mercedes Benz C-Class, the BMW 3-Series and the Audi A4 while the XF competes with the Mercedes E-Class, BMW 5-Series and Audi A6. Jaguar's sedans have stood out in their respective segments with their sorted driving dynamics and supple ride. The company is now hoping that these engines will bridge the gap with their rivals in terms of powertrain refinement and efficiency. This launch is also in line with the shift in buyer preference that is being seen across segments in the car industry. Petrol engines have started to regain popularity in the wake of increased scrutiny on diesel engine emissions and governments seek to come up with tougher legislation to limit their use.